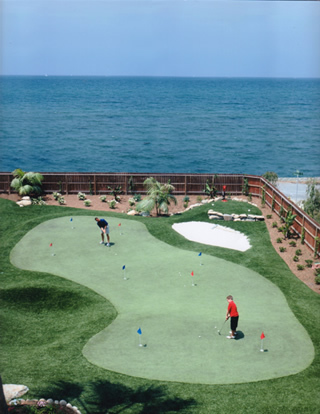 For the golf enthusiast, what happens on the driving range is crucial to what will happen when they tee it up for real. The last thing they need is the inaccurate, ineffective, and frustrating feel of hitting off of a mat. While mats are standard in many practice facilities, Southwest Greens would like to remind you they aren't the standard. Make your practice facility stand out and provide a realistic driving setting with our custom tee lines. Made from the finest synthetic turf on the market and the same turf used for our backyard putting greens our tee lines provide the true feel of the tee box and a setting in which to truly work on one's game. Southwest Greens has taken short game practice to a new level by bringing the home putting green to neighborhoods nationwide. Now we're helping your customers take their long game to further and more accurate distances. 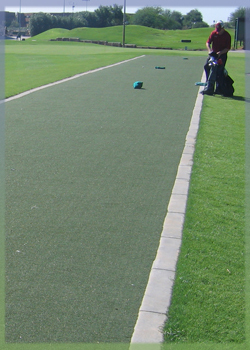 Tee lines eliminate the lack of distance and accuracy associated with standard golf mats. The very least a golfer should expect from his or her practice facility is a realistic feel, and because our tee lines look and react like the real thing that's exactly what they'll get. Our lines allow players to place regular tees directly into the hitting surface, enabling a truer feel at contact and an accurate assessment of their long game. 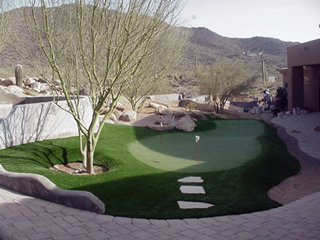 Tee lines from Southwest Greens bring the added advantage of maximum durability. They are simply perfect for heavy traffic areas, and if ever there was a heavy traffic area then a driving range would certainly qualify. Each tee line is built to last from 10 to 15 years, and because your tee lines are made from synthetic turf there will be minimal maintenance involved. Imagine no watering, no mowing, and no replacing divots ever again. Such dependability will go a long way in providing your customers with a practice experience they can build upon for maximum results. Help maximize those results with tee lines that adhere to the old adage practice makes perfect. 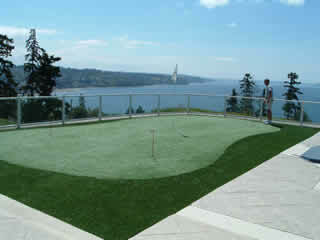 Make certain your driving range is outfitted with synthetic tee lines that embody the look and feel of natural grass. By doing so, you'll make certain the point of contact with those using your facility is as much of a hit as the tee lines they'll be teeing off of. Southwest Greens Seattle hopes you've enjoyed the preceding article. It is our hope that its inclusion on the Southwest Greens Seattle website provided you with a fresh perspective and perhaps some fresh new ideas on the subjects of sports and home improvement. In the future we'll continue to include pieces that shed new light on great new ways to improve the look and feel of your home's interior and exterior while indulging in the games you love. 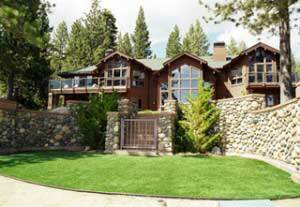 Is it time you freshened up the look of your home? Would you like to find a way to enjoy the games you love in the comfort of your own home? If so, remember that home improvement can be fun, easy, and affordable. Continue to look here as we promise to point you in a number of exciting directions. And while you're here, take a look around our website and learn about the number of ways Southwest Greens Seattle can aid in the creation of your dream home. Thanks for checking in, and be sure to visit us regularly for more great articles full of exciting new ideas.